Put all items in blender and blend. 405 members have added this recipe to their cookbook. I would eliminate the sweetener, apple juice, frozen anything. Would use fresh berries, organic plant protein, fresh organic broccoli. I have lost my appetite for anything sweet. Replaced 1/2 scoop whey protein with 2 Tbsp's of Cold Milled Golden Flax Seed. The Cold Milled Golden Flax Seed added 2800mg Omega-3, 3g Protein, 4g Fiber to the drink. Broccoli? Really? Some recipes just go to far in the name of health. Broccoli has a place, and in fact I love it, but it does not belong in a fruit smoothie. this is just dumb. skim or almond milk/vanilla like drinking dessert Love Rasberries too. Tastes delicious, you'd never know the broccoli was in there! YUM! 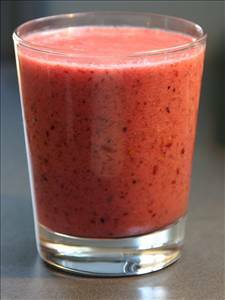 There are 245 calories in 1 serving of Morning Berry Smoothie. Calorie break-down: 6% fat, 70% carbs, 24% protein.